No got bread! Got wodka, mleek i mieso. What about "Do you have any bread?" This seems like a good translation, but it was counted wrong. No. 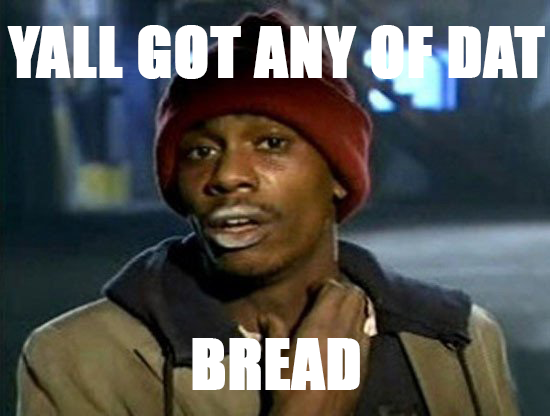 "Do you have any bread?" means "Masz jakiś chleb?". Between "Masz chleb?" and "Masz jakiś chleb?" is difference. Little, but yeah. Yes, it's a good one - a glitch to report, I guess :). Report it, you should be right. The toughest thing in Polish is getting the cases down. I mean you can understand what each case means but getting the endings correct takes a lot of practice. Its harder in russian. I, as a native russian speaker can surely say so. mary_beth I am a pole and I learned when exactly you have to use czy in a question. You should use it when you want to hear yes or no as an answer. In which case is "chleb" in this sentence? Accusative. "Bread" is not animate, and for masculine non animate nouns their Accusative is the same as Nominative. Having said that, there are quite a lot of nouns that are grammatically 'animate' for no reason, including most vegetables and fruits. But you will encounter it later, let's leave that aside now. help me out on this one i wrote down this but now i am confused as hell, macie dzieci? = do you have children? but: masz chleb? = do you have bread? do they mean the same, or do you put/say masz if it is lifeless? Macie is for you (plural) while masz is for you (singular) I think. Should this be "czy masz chleb?" I don't understand when to use "czy" in a question. "Have you bread?" is the correct written form. We also say it, too! Yes, we say "Have you got...?" more often. But... am I the onlyone italian there? How can it be 'do you have bread' as well? what do you mean? as well as what? As well as 'you have bread'. in Polish a yes/no question is form by either adding the word "czy" before a statement, or just changing intonation (speaking) /adding "? "( writing). Latter is less formal, but perfectly correct. Difference between masz and macie?? In English, "you" can be 2nd person singular, or 2nd person plural. Polish differentiates between them. So "masz" is for singular "you", and "macie" for plural "you". How is it easier than Russian? I mean, you can use ли, but at least in the Duolingo course, that wasn't too common... otherwise it was the same... Well, Polish has "czy". Czy masz chleb? Czy nie? Does the a sound like the a in mash or the a in father? Also, this is the same in Ukrainian. We use 'чи' ('сzy') 'do' in the beginning of the yes/no sentence. "Чи ти знаєш...?" ('Pronounced as: "Chy ty znayesh...?") for "Do you know...?" as in Polish: "Czy wiecz...?" I hear masx chlebT! Does this sentence end by a T sound? Absolutely not. Technically it ends with a p because of the final devoicing. This is not something a native speaker thinks of when pronouncing the word, it's just what happens in real speech. This can also be "Ty masz chleb" right ? Yes, although especially in a question, I wouldn't recommend it. I'd say either "Masz chleb?" (most neutral) or "Czy ty masz chleb?" (more emphasis on 'you').